The below Dartfish profile is based on what I have learned and observed while keeping these fish. They certainly are active little fish to keep and will add a lot of viewing pleasure to any aquarium. They are a small and comparatively long fish with a grey to green colored body and several black bars or stripes on them that have a very slight yellow to light green boarder on both edges of the black bars. Zebra Dartfish are great community fish. 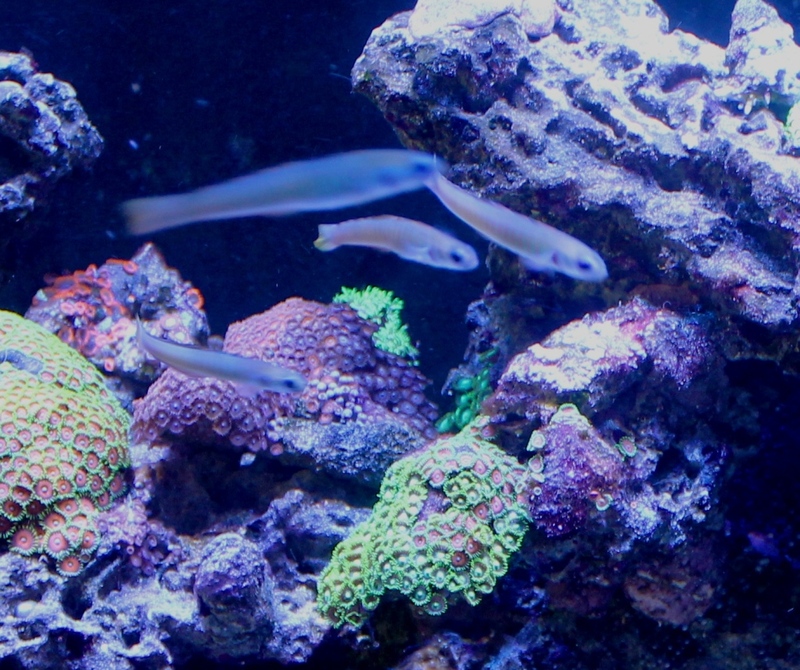 They are very peaceful and reef safe. They are very active and very fast swimmers and should be kept with other fish that will not get spooked by their activity level and fast movements of this Dartfish. They are a schooling fish so you will need to keep at least 6 of them together in the same tank. Based on my experience with them, they seem to do better when you have 8 or more which is why I would recommend keeping them in schools of 10. 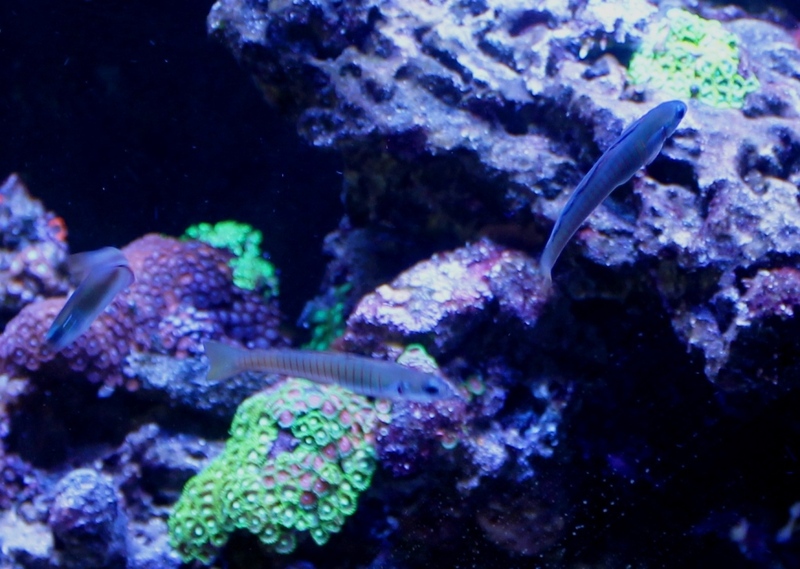 They work very well as dither fish potentially allowing other fish to feel more comfortable through seeing other fish swimming around in the aquarium. 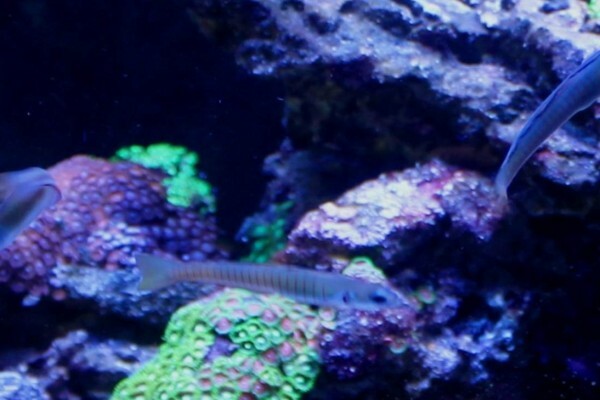 Although this is a small fish, the Zebra Dartfish is a very active fish and should be kept in a 48 inch long tank to allow for the minimum amount of open swimming spaces which they typically need. You will also need to have some hiding spots for these fish to go to when they feel stressed or threatened. A lot of small hiding spots in your live rock throughout the aquarium will work best for these fish. Zebra Dartfish need a tank with a closed top as they have been known to jump out of the tank very often when kept in a open top tank. Zebra Dartfish are carnivores. They will do best with a wide range of meaty foods like brine shrimp or mysis shrimp just to name two of them. Just make sure it is a food that is small enough for the Zebra Dartfish to get in its mouth. A good quality flake or proper sized pellet food for marine carnivores would also be a good option. I have several of the fish and I only have one who doesn’t spend all of his time in the rocks. I love the coloration and although they aren’t a brightly colored fish, the fish has a very nice pattern and some color.